The Federal Communications Commission, the agency tasked with regulating everything from broadcast television stations to the internet, was the source of Trump's ire Tuesday night when he tweeted his dismay over the agency stymieing Sinclair Broadcasting Group's attempt to acquire Tribune Media. "So sad and unfair that the FCC wouldn't approve the Sinclair Broadcast merger with Tribune," Trump tweeted on Tuesday. "This would have been a great and much needed Conservative voice for and of the People. Liberal Fake News NBC and Comcast gets approved, much bigger, but not Sinclair. Disgraceful!" Trump's tweet puts FCC chair Ajit Pai, a Republican appointed by Trump, in the awkward position of having to defend the commission and assert its position as an independent regulatory agency that is not directly accountable to the president or other elected officials. Democrat commissioner Jessica Rosenworcel replied to Trump's tweet on Tuesday with one word: "Disagree." At a House Energy and Commerce subcommittee hearing on Wednesday afternoon, Pai would not directly say whether he agreed or disagreed with Trump's tweet when pressed by Rep. Frank Pallone (D-N.J.). Pai would only say "I stand by our decision" to send the transaction to a hearing last week after expressing concerns about Sinclair's bid for Tribune Media. Inside Sinclair, there were bewildered reactions to the president's defense of the company. "Trump's tweet actually hurts us -- because of the conservative line," one staffer said. Other Sinclair journalists seconded this point, saying colleagues were unhappy with Trump's portrayal of the company as "conservative." While stations have been forced to air pro-Trump commentaries and stories, most journalists at local stations want to be recognized for their straight-forward, nonpartisan work. They don't want to be labeled by the president or anyone else. 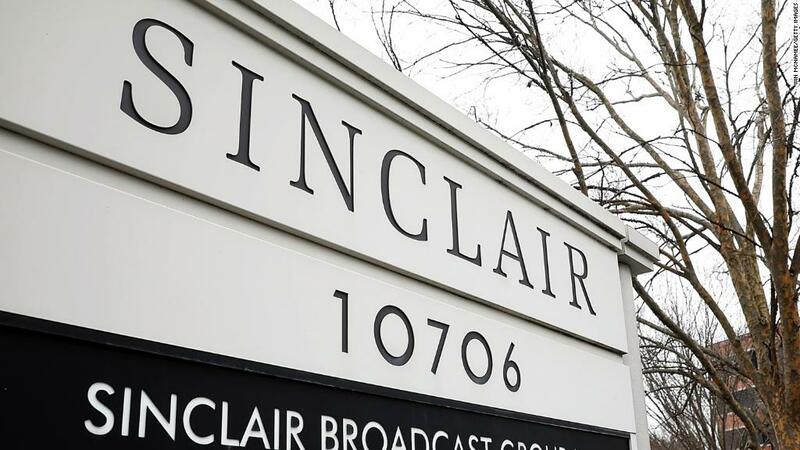 Sinclair is the largest owner of local television stations across the United States and is trying to get even bigger through the $3.9 billion Tribune deal. It's also well known as a conservative-leaning media organization that forces its stations to run opinion segments supportive of the president and conservative causes. Last week, Pai and his fellow commissioners referred the proposed Sinclair deal to an administrative law judge hearing after the commission said it had "serious concerns" about the transaction. Pai and the commission's decision shocked many in the media world, since Pai had recently loosened TV station ownership rules that helped Sinclair close its deal with Tribune Media. That prompted the FCC internal watchdog to launch an investigation into whether the commission had improperly pushed for the rule change to benefit Sinclair. On Wednesday, a D.C. Circuit Court of Appeals threw out a challenge to the decision by public interest groups, saying they had no standing. There was the Justice Department lawsuit to stop AT&T's acquisition of Time Warner (CNN's parent company), something Trump promised to do on the campaign trail. Though Trump said as a candidate he wanted to stop the deal because it would give one company too much power, his well-known animosity toward CNN led many to speculate that politics were behind his desire to block the deal -- though his name was never brought up during the trial. The Justice Department lost its lawsuit in June, but it is now appealing the judge's decision to approve the merger.